There are always several spots for South Jersey boys hoops fans to find great basketball, from Camden to the Shore. But for the 2014-15 season, the best place to start is Cherry Hill. Last year was an unforgettable one at Cherry Hill East, as the Cougars defeated Cherokee in the South Jersey Group IV championship game for the first sectional title in school history. Although several key players have graduated, Jake Silpe—the heart and soul of the team—is back for his senior year. The point guard, who has committed to the University of Pennsylvania, averaged 15.3 points, 6.9 assists and 4.7 rebounds last season on his way to all-South Jersey first-team honors. Silpe is joined by 6-foot-8 junior forward/center Timmy Perry, the son of former Temple star and NBA player Tim Perry. Across town at Cherry Hill West, the Lions have their own senior star in 6-6 forward Can Oztamur, a native of Turkey who was eighth in South Jersey in scoring last year with a 19.5 average. West also brings back senior guard Elijah Bey, a three-year starter, and 6-4 junior forward Danny Buckwalter, the team captain. The Lions won the Olympic Conference Patriot Division last year for their first division title since 1995, and also topped Clearview for their first playoff victory since 1998. Yet another Cherry Hill program to watch is perennial power Camden Catholic, which went 21-7 last year in the first season under head coach Matt Crawford, who succeeded his father Jim on the bench. The Fighting Irish welcome back a pair of senior starters in forward Brendan Crawford and guard Courtney Cubbage, who scored 31 points in a playoff win over Monsignor Donovan. They’ll also get a big boost from the return of senior center Demola Onifade, a native of Nigeria who missed all but one game last year due to injury. Another Crawford joins the Olympic Conference this season at Eastern, where Matt’s older brother Kevin is the new head coach after leading Pitman to the Group I state championship last year. He must replace Matt Klinewski, who led South Jersey in scoring last year as a senior for the Olympic American champs, but the Vikings do return starters Maliq Sanders, Logan Edwards and John Salicandro. Elsewhere in the Olympic, Cherokee said goodbye to a terrific senior class but will move forward with leading scorer Paul Bellamy, a senior who averaged 12.7 points. And three traditionally strong programs will look to bounce back from losing seasons. Shawnee suffered the first losing campaign in legendary coach Joe Kessler’s 27 years at the helm, but the Renegades hope senior guard Alec Warren and junior forward Dean Austin can help them return to their winning ways. Injuries were a factor as Lenape dropped from Olympic American champs to 10-18, but the Indians bring back three starters in Ryan McMahon, Kelsey Gray and Jordan Russell. 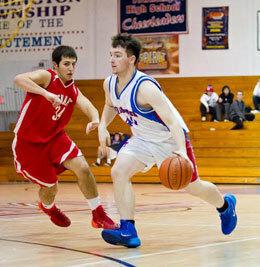 Washington Township expects a solid junior class led by guard Spencer Cook and forward Nick McGough (pictured) to help the program improve on an 11-16 record. Paul VI, meanwhile, has been one of the top teams in South Jersey over the last three years, including last year when it went 23-4 and reached its third straight South Jersey Non-Public A title game. But seven seniors are gone from that team, including all-South Jersey forward Jay Howard. Junior Lonnie Moore is one of the few returners with varsity experience. The Eagles’ rival, Bishop Eustace, brings back all-conference first-team forward Brandon Cazan from a 20-9 team. In the Colonial Conference, Haddonfield is coming off yet another memorable season. The Bulldawgs went undefeated until suffering a 66-57 loss to Camden in the South Jersey Group II semifinals and should be a contender yet again. They are led by senior twin brothers Nick and Rob DePersia, both four-year varsity players. In the Tri-County Conference, Glou­cester Catholic and Clearview both have senior-laden teams that expect to make noise this year. The Rams are paced by leading scorer Matt Green, while the Pioneers have a four-year varsity player in point guard Gavin Bright. In the Burlington County Scholastic League, Moorestown is coming off a 14-12 season but must replace one of the best scorers in the area in Seth West. Moorestown Friends, a member of the Friends School League, is hoping to build on last year’s promising 9-14 record, a five-win improvement from the year before.